Fiber Fusion™ Daily / 120 Veg Caps - Nature's Way®. It's essential that your body receives an ample amount of fiber, every day. Fiber Fusion™ Daily provides an additional, reliable source. Detoxification products containing clay can deplete the body of healthy minerals, and often contain high levels of lead and other toxins. Since Fiber Fusion™ Daily is clay-free, you can rely on it every day! Take 4 capsules daily with at least 8 oz of liquid. If desired, may be taken as 2 capsules in the morning and 2 capsules at night with at least 8 oz of liquid. Will Fiber Fusion Daily affect the absorption of prescription medications? 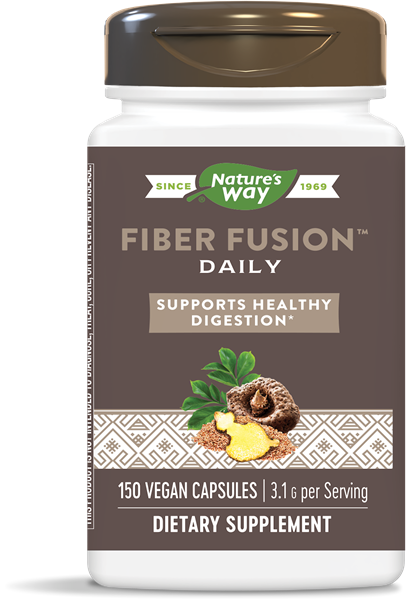 Why was psyllium chosen as the source of fiber in Fiber Fusion Daily? Do not take this product if you have difficulty swallowing. Take this product with at least a full glass of liquid. Taking this product without adequate fluid may cause it to swell and block your throat or esophagus and may cause choking. If you experience chest pain, vomiting, or difficulty swallowing or breathing after taking this product, seek immediate medical attention. If pregnant, nursing, or taking any medications, consult a healthcare professional before use.